The conduct of such an experimental “fly” game had its impetus from a desire in the mid-1850s by the Knickerbockers to change the rules of the game “from the easy mode in which they have hitherto played it.”3 They were particularly uncomfortable with the “bound” out counted as an out any ball caught on one bounce. Although the Knickerbockers had failed to get the bound out excluded, they nevertheless forbade it during their intra-club practice games. In early 1859, they were finally able to persuade another club, the Excelsiors of South Brooklyn, “between whom and themselves the most cordial sentiments of friendship exists,” to play an experimental club-vs.-club game that excluded the bound out. The quality of play during the first half, which had the Excelsiors leading 24-15 after five innings, was sloppy. The Sunday Mercury reported that “There was some very bad fielding, and wild throwing on both sides, and on the part of some of the Knickerbocker members, a want of judgment in disposing of the ball, was plainly discernable.” The last was perhaps best epitomized in the second inning, when, with one out and runners on second and third, the Knicks’ right fielder Samuel Kissam caught a fly ball struck by Edwin Russell of the Excelsiors and, “apparently forgetting himself, sent the ball to third base, instead of second (which the lead runner had left and was bound to return to).”4 The lost out would have terminated the inning without the Excelsiors scoring a run. Instead subsequent strikes by John Holder, Thomas Reynolds, and Harry Ditmas Polhemus brought in four runs. 1 “Out-Door Sports: Base Ball: Matches to Come Off,” Sunday Mercury, 29 May 1859, p. 5, col. 4. For previous discussions of the fly-vs.-bound debate, which extend the story through the eventual elimination of the bound out in 1864, see Warren Goldstein, Playing for Keeps: A History of Early Baseball (Ithaca and London: Cornell University Press, 1989), pp. 48-53; Andrew J. Schiff, “The Father of Baseball”: A Biography of Henry Chadwick (Jefferson, N.C. and London: McFarland & Company, Inc., Publishers, 2008), pp. 51-58; and William J. Ryczek, Baseball’s First Inning: A History of the National Pastime Through the Civil War (Jefferson, N.C. and London: McFarland & Company, Inc., Publishers, 2009), pp. 174-178. 2 “Base Ball: Excelsior Club, of South Brooklyn, versus Knickerbocker Club, of New-York,” New York Times, vol. 8, no. 2428 (1 Jul 1859), p. 4, col. 6. 3 “The Base Ball Convention and their New Rules,” New York Clipper, c. February 1857 clipping in Rankin scrapbook, Mears Collection, Cleveland Public Library. 4 “Out-Door Sports: Base Ball: The ‘Fly’ Game Between the Knickerbocker and Excelsior Clubs,” Sunday Mercury, 3 July 1859, p. 5, col. 4. 6 Both accounts, cited in the next two reference notes, used similar language to encourage the playing of a return game in Brooklyn. The account in Porter’s stated: “We hope that these clubs will afford our friends, on the other side of the river [i.e., in Brooklyn] an opportunity of judging of the merits of the catch-on-the-fly, by having a return match on the Excelsior grounds, which, in several respects, is favorably located for a fly game. Give us the return match, gentlemen, and as soon as you can.” The account in the Clipper stated: “We sincerely trust that these excellent clubs will, by a return match on the Excelsior grounds, give our Brooklyn friends an opportunity of witnessing the brilliant play the catch-on-the-fly rule admits of. Play a return by all means, gentlemen, and let us know when, that we may be there to witness a second triumph of our favorite play.” Chadwick became the Clipper’s chief baseball correspondent in June 1857. In at least one earlier instance he internally identified himself as the author of a game account in Porter’s. An account of a previous Knickerbocker-Excelsior game played on 8 July 1858 reported, regarding post-game activities, that “Our reporter—Mr. Chadwick—was called upon to respond to the toast of ‘The Press,’ but being somewhat diffident of his oratorical powers, he quietly retreated a moment before the call, having previously deputied the gentleman from the Tribune to respond, which duty he ably performed.” Significantly, this same account also included the observation that “The fielding of the Knickerbockers was marked by some excellent catches ‘on the fly.’ Their opponents seemed to prefer the surer, but less skillful method, of taking the ball on the first bound, a style of catching more suitable to juveniles we think ….” “Out-Door Sports: Base-Ball: Great Base-Ball Match in Brooklyn: Excelsior vs. Knickerbocker,” Porter’s Spirit of the Times, vol. 4, no. 20 (17 July 1858), p. 309, col. 1. 7 “Ball Play: The Base Ball Convention: the Fly Rule Adopted by a Large Majority,” New York Clipper, 23 December 1864. 8 Other early identified instances of “fly” games include Champion Jr. (NY) vs. Enterprise Jr. (Morrisania), 6 August and early October 1859; Knickerbocker (NY) vs. Empire (NY), 10 or 11 August 1859; Star (South Brooklyn) vs. Knickerbocker (NY), 13 September 1859; Manhattan vs. Oriental, 29 September or 6 October 1859; Excelsior (South Brooklyn) vs. Charter Oak (Brooklyn), 21 June 1860; America (South Brooklyn) vs. Twilight (South Brooklyn), 7 July 1860; Excelsior (South Brooklyn) vs. Putnam (Brooklyn, E.D. 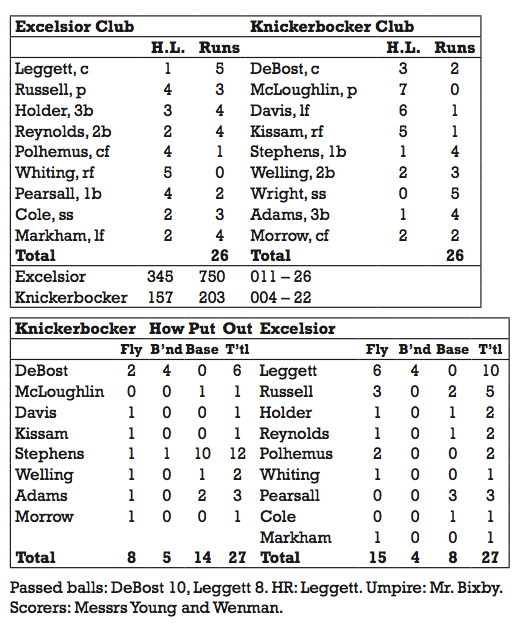 ), 4 August 1860; Excelsior (South Brooklyn) vs. Knickerbocker (NY), 25 August 1860; Mohawk Jr. (Brooklyn) vs. Nassau Jr. (Brooklyn), 27 October 1860.